Great Cartoonists and their Art, by Art Wood, Pelican Publishing, 1987 (ISBN 0-88289-476-5). Out of print but available from various sellers on ABE Books website. This book sat unread on my bookshelf for years. A friend of mine who will remain nameless has nothing but bad things to say about the author, Art Wood, and this book, so I didn't bother to read it until just recently. Beyond my friend's personal dislike of Wood, he poo-poos the book as being rife with errors. And on that count he does have a point. To cite a few examples, Wood talks about Windsor McCay, and says Li'l Abner ended in 1967. 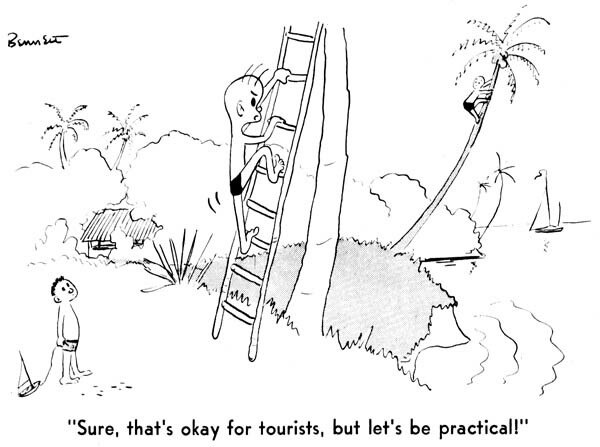 But Wood makes no argument that he is a cartooning scholar. He is rather an unabashed fan of cartooning, and has been since he was a kid. This book is really about his various sojourns to visit with and collect art from his heroes. 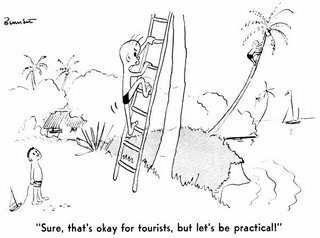 Wood started collecting original cartoons when he was 12, and thanks to an indulgent father who encouraged and abetted him, got to visit many cartooning greats. 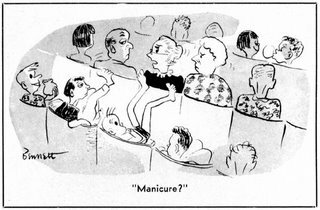 Art would first make contact with cartoonists by mail, asking if he might visit them, and when positive responses were received, dad would take Art on road trips to New York, Washington and elsewhere to make good on the invitations. Art was not a bit bashful about asking for originals, and the art reproduced in this book, mostly bearing inscriptions to him, speaks to his success. 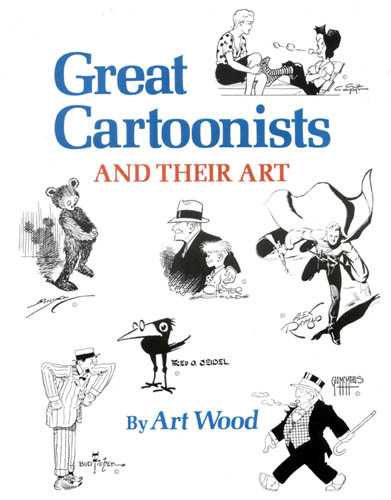 But the real treats are Wood's reminiscences of his visits with these legendary cartoonists. Wood's stories are unvarnished - some cartoonists were kind and friendly to a fault, others were gruff, even belligerent. Some are terribly sad - his visits with Bud Fisher and Richard 'Moco' Yardley are painful to read. So if you yearn to know a little bit more about the people behind the pretty pictures, this book is definitely for you. If you take the history lessons with a pinch of salt you'll find the book endlessly entertaining. Gordon Fife was one of the first products of the Watkins Syndicate. For years I thought Watkins was the syndication division of the Brooklyn Eagle because the Eagle ran much of their material, and both Maurice Horn and Ron Goulart claimed there was a connection. I just recently learned that assumption could be wrong. According to the E&P Syndicate Directory of 1939, Watkins was based in Philadelphia, not New York. So at this point I don't know whether Watkins was associated with some paper or not. I do know that I haven't seen their material running in any Philadelphia papers, but that could easily be explained by gaps in my research or collection. What I really need to do is cross-reference the syndicate's address (2214 Chestnut Street) with the addresses of Philadelphia newspapers to see if I come up with a match. So if anyone has information on Watkins I'd love to hear from you. 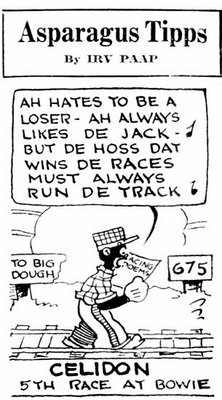 Watkins is a very interesting syndicate not only for the material I have found, but even more so for the interesting strips I haven't. In 1939 Watkins advertised a whole batch of interesting titles in the E&P Syndicate Directory - Air Sub DX, Fantom of the Fair, Masked Marvel, Skyrocket Steele, etc. Comic book fans will recognize these names as characters from the Centaur comic book company. What's the connection? I dunno. Anyway, back to Gordon Fife. 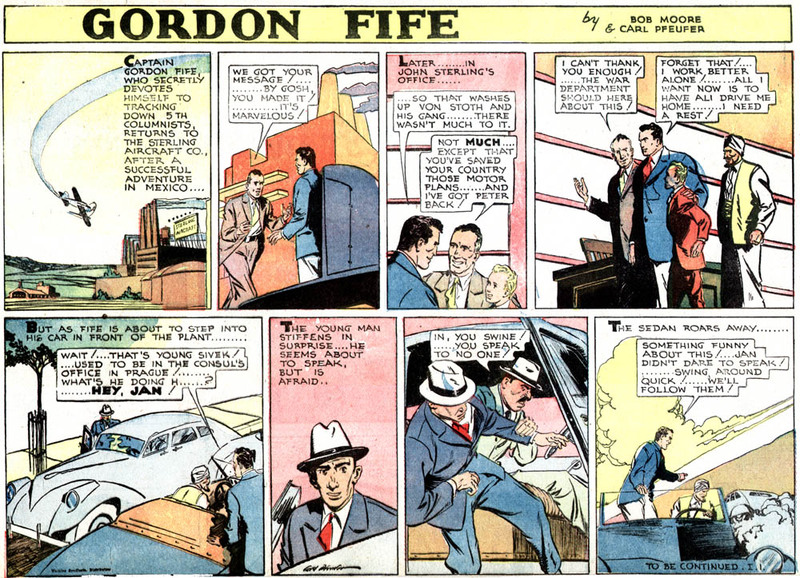 The strip started as a daily titled Gordon Fife, Soldier of Fortune. Horn says it was alternatively titled Gordon Fife and the Boy King - this must have been very early on because it was changed by February 1936, from which my earliest examples. The strip was written by Bob Moore and initially drawn by Jim Hales. Carl Pfeufer took over the art duties in December 1936. Pfeufer had a sketchy style that showed a lot of Alex Raymond influence (okay, swipes). To really enjoy Pfeufer's work it's important to pay attention to the great backgrounds - he loved to draw fanciful art deco buildings and machinery. The sample above includes several neat Pfeufer touches. Gordon Fife was an amateur adventurer, constantly stumbling into intrigue of one sort or another. As the title suggests he started out as a soldier for hire, later on he took on any adventure that fell into his lap, which, of course, they did with stunning regularity. The continuities, though far-fetched, were quite well-written in comparison with many others of this burgeoning genre. The success of Terry and the Pirates and the Captain Easy character in the Wash Tubbs strip seemed to have had everyone jumping on the adventure bandwagon at the time. The daily, which is exceedingly rare, ran until 3/27/1941 in the Brooklyn Eagle according to Jeffrey Lindenblatt. Horn says it lasted until July, apparently citing the same paper as source. I'd say trust Jeffrey, but his date is a Thursday, so I have to say the matter could use a confirmation one way or the other. A Gordon Fife Sunday was added on August 11 1940, and was soon being sold as a new companion strip to Don Dixon when that strip lost its long-running topper Tad of the Tanbark, which ended in November or December of 1940. According to Maurice Horn, the Gordon Fife Sunday also ended in July 1941, which it did in the Brooklyn Eagle, but actually it ran until January 11 1942, at least in the San Francisco Chronicle. Jeffrey Lindenblatt called to tell me that he stands behind his daily end date cited above, and adds that the strip, which had a letter and number system to demark stories, ended in the Eagle with strip R-80. So if anyone is going to dispute the date they need only find a higher numbered strip. Jeffrey also mentions that Gordon Fife was replaced by the Eagle the next Monday with Tarzan. I was lookin into a Bob Moore who did caricatures for film companies and may be the one that ended up with Disney. But he was born in 1920 and too young to be working in 1935/6. He also turns up a lot in the missing strips... so who is he? The New York Evening Graphic was really enamored of photo comics. In addition to Antics of Arabella, here's two that appeared in the paper in 1926. The Hall-Mills case photo-comic went on for a long time, describing in minute detail that sensational case. You can read the lurid details of the case on Wikipedia here. This 'strip', by the way, doesn't qualify for the Stripper's Guide index because I classify it as more of a heavily illustrated news story. In the oughts and teens the big papers got cartoonists to do similar duty, illustrating the details of certain stories in strip format, but to my knowledge the Graphic was the only one that regularly committed their most sensational stories to photo strip form. The other photo comic is a serial summarization of the then new movie The Return of Peter Grimm (imdb link). These photo comics were supplied by the movie studios, and it's an advertising gimmick that was used sporadically right through the 40s at least. They seem to pop up in fits and starts; there doesn't seem to have ever been a standing order at any studio for films to be serialized in this way. business and had a tremendous following. distributed. Then suddenly he chucked it all. works for TV and radio. hit six straight long shots in one week. This phenomena had track circles agog. it had added 35,000 readers. of the horse out and then have it set up in type just before we went to press. Little things used to make big doings on the Graphic in Gould's time. much space to unknowns as Sully Montgomery.' It was signed by Gauvreau. Graphic. I went looking for Gauvreau while Jennings tried to reason with me. fairly flew out of the office before he could figure it all out. then all I could do was gulp." Much as I would like to be given credit for remembering such trivia, it was Thrillmer who brought up the subject. Right you are! Thanks. Mind like a steel sieve, that's me. Local panel Hilo Hank appeared only in the Hilo (Hawaii) Tribune-Herald. Wish I could claim that my researches extended to such far-flung papers, but actually I found this feature only through the little pamphlet shown above. 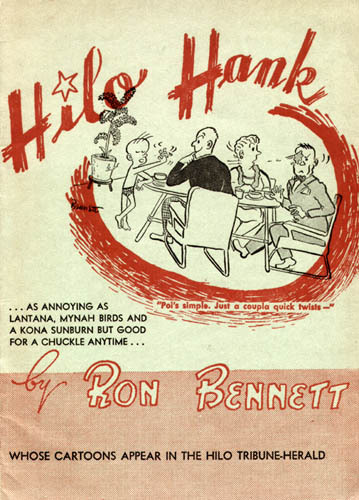 According to the introduction, reporter Ron Bennett produced this weekly panel cartoon as a sideline to his regular duties on the paper. The booklet is copyrighted 1949, and is mute concerning the length of time the panel had run thus far. Any blog readers out there in the Aloha State able to tell us more about Bennett or his delightful little feature? What a great title! 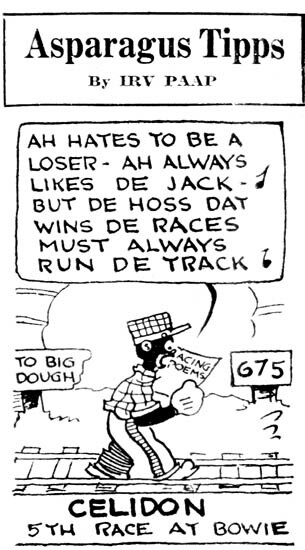 This little horse racing tip panel was syndicated by the Graphic Syndicate, and was variously attributed to Irv Papp and someone who preferred to be known only as 'Tony'. The panel had limited interest outside New York so it is rarely, if ever, seen outside the Evening Graphic. Its main reason for being was to give plungers a hot tip of the day for a New York area track. To garner interest outisde New York, a lucky number was also included (for those whose gambling obsession ran to the numbers games). Unfortunately, the creators didn't take into account that numbers games were played mostly in the black community, so the racist depiction of the panel's star didn't exactly endear the feature to black readers. Asparagus Tipps started sometime in 1926, and lasted until at least 1929. For some reason I thought Will Gould (of Red Barry fame) was behind Asparagus Tipps. Do you know if he worked on an earlier or later version of this title? Thrillmer, your comment tickled the far-reaches of my memory. I did some homework on the subject, and will answer your question at length in tomorrow's post. Stay tooned! 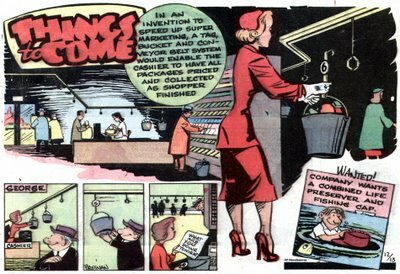 The American fascination with technology came to the comics not just through Buck Rogers and Flash Gordon. There were also more down-to-earth features that sought to emulate the style of such magazines as Popular Science. Things To Come, perhaps the first feature to regularly concentrate on speculative technology, was later joined by the more outlandish Closer Than We Think (blogged here) and the very successful Our New Age. Things To Come, named after the H.G. Wells book The Shape of Things to Come (which you can read in its entirety here) , was an Associated Press Sunday feature that started in 1941 or '42. It was written and drawn by Hank Barrow, whose masterful work deserved a far larger audience than it received. Barrow left the feature in 1949 or 1950 and it was taken over by Jim Bresnan, whose style, shown here in our sample, was bold and appealing. For reasons unknown the AP Sundays were never good sellers, and Things To Come was no exception. It really is a shame that this excellent feature was never exposed to a wider audience. The feature ended on January 30 1955. Barrow also did editorial cartoons for AP in 1936 when Sickles was doing them. Both were succeeded by Morris. Barrow then took over Caniff's The Gay Thirties in a style that was remarkably close to Caniff's previous one.